Aluga-se (Se alquila) es un grupo de 16 artistas que reside y trabaja en São Paulo. Realiza encuentros semanales en un estudio para discutir sus proyectos artísticos. También busca la itinerancia exponiendo en diversos espacios y ciudades, buscando la interacción con artistas locales. “Hasta Medio Quilo” es un proyecto del Grupo Aluga-se (Se alquila) que consiste en cada artista enviar por correo, en un sobre A4, las obras de los 16 participantes del grupo más 42 invitados. El museo recibirá por correo todos los sobres con las obras participantes. Todos los trabajos podrán tener sus medidas adaptadas al espacio expositivo. El objetivo es que cada artista organice su obra de forma a caber en un sobre de correo y que esa obra sea transportada como una correspondencia normal y corriente. En el sobre, además de la obra se encuentran las instrucciones para su montaje. Estos sobres con el lado del remitente expuesto, presentan al mismo tiempo cada artista participante y la idea de la exposición. Nuestro interés es ejercitar el pensamiento de movilidad y también formar un mapa, a través de los sobres, de nuestro recorrido como grupo por los diversos lugares. The search for new ways to share contemporary art is a very powerful concept for this group of artists who met for the first time in an empty house listed for rent. The result of this meetings, other than the exhibition itself ,was a series of lectures and workshops that lasted several months. From there, the idea of ​​creating new situations for art, rather than waiting for them to happen, was widening and branching and still organizes the group’s actions today. What prevailed from the first experience, is the certainty that self-organization and the construction of alternative structures for the work, is an important way for the presentation of the groups’ work. The group participants live and work in São Paulo. Weekly meetings are held in a studio to discuss contemporary art. The group seeks exposure by holding exhibitions in different spaces and cities looking also to interact with local artists. 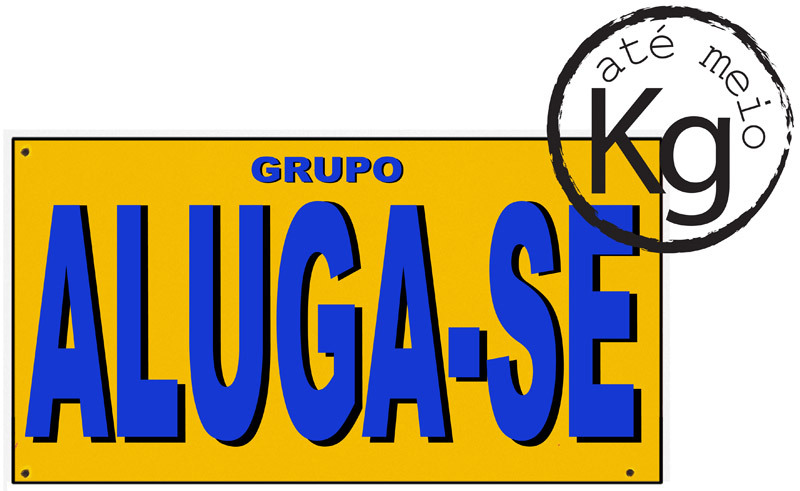 Why the name Aluga-se (For rent)? The first exhibition took place in a house that was listed for rent for a long time. A group of artists settled in for six months, planning, renovating the house and setting up the exhibition, which lasted three months. Our goal when assembling the project “Half a Kilo Tops”, is to create an exhibition that goes to the idea of a small collection. Many artists who are part of this project, present their work mostly in small formats. the intention is that the walls of the exhibition room would be fully covered by the group’s work, in order to create the idea of ​​a gathering of objects and images that a collection suggests. Organizing the works on the walls and spaces is quite free and the museum staff have full autonomy in choosing the order and position of the works. Always taking into account the thought of accumulation, variety and diversity. The ownership and the need for blank spaces between the works are not as important as the project itself. We like to think of ourselves as a small nomadic exhibition, a collection without hierarchy. Possuo graduação em Artes Visuais-UFPB, participei de exposições coletivas e trabalhos em ensino de arte. Sou mineira e moro em João Pessoa, Paraíba. A proposta do grupo é muito interessante e gostaria de participar. Ainda é possivel? Como?